Dynamic nonlinear equation is a kind of important nonlinear systems, and many practical problems can be formulated as a dynamic nonlinear equation in mathematics to be solved. 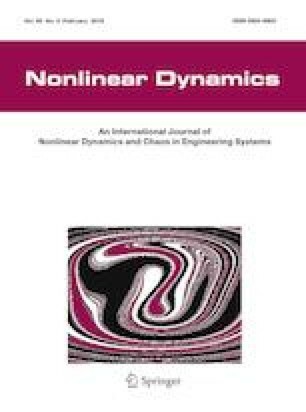 Inspired by the negative impact of additive noises on zeroing neural dynamics (ZND) for dynamic nonlinear equation, a robust nonlinear neural dynamics (RNND) is designed and presented to achieve noise suppression and finite-time convergence simultaneously. Compared to the existing ZND model only with finite-time convergence, the proposed RNND model inherently possesses the extra robustness property in front of additive noises, in addition to finite-time convergence. Furthermore, design process, theoretical analysis, and numerical verification of the proposed RNND model are supplied in details. Both theoretical and numerical results validate the better property of the proposed RNND model for solving such a nonlinear equation in the presence of external disturbances, as compared to the ZND model. This work was supported in part by the National Natural Science Foundation of China under Grant 61866013, Grant 61503152, Grant 61473259, and Grant 61563017, and in part by the Natural Science Foundation of Hunan Province of China under Grant 2019JJ50478, Grant 18A289, Grant 2016JJ2101, Grant 2018TP1018, Grant 2018RS3065, Grant 15B192, and Grant 17A173. In addition, the author would like to thank the editors and anonymous reviewers for their valuable suggestions and constructive comments which have really helped the author improve very much the presentation and quality of this paper.